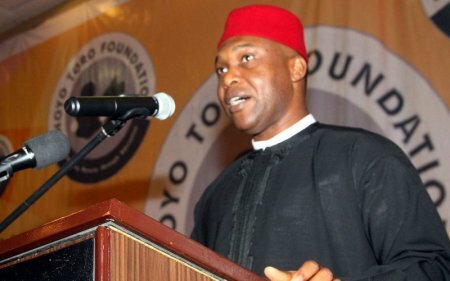 Candidate of the United Progressive Party, UPP, Osita Chidoka has conceded defeat in Saturday’s Anambra governorship election. He however said that he lost the election to the superior financial firepower of governor Willie Obiano’s All Progressive Grand Alliance, APGA. With most of the results already announced, Obiano has taken an unassailable lead having won in all the local governments declared so far. Chidoka in a statement, said he accepted the results but hoped the people have not mortgaged the future of the state by selling their votes to the highest bidder. Declaration Of The Candidate Of The United Progressive Party (UPP), Chief OsitaChidoka On The Outcome Of The November 18, 2017 Anambra Governorship Election. On September 30, 2017 we officially flagged-off our campaigns for the election. That event at Uli, the remarkable site of the historic Biafra Airport remains significant to our people in our collective search for a new beginning. Our campaign attracted the finest and brightest of Anambra. The bold and the courageous were with us as we exerted our best in running the most robust issue-based and technology-driven campaign in the history of our dear state. We attempted to change the course of events and chart a new beginning for our state. We believed and we dared; we engaged with all patriotic vigour as we held strongly that the long awaited time for our people to experience a new opportunity had come and we labored for it. In all, our focus was the people; the forgotten, the poor and the disadvantaged. They were the prime impetus for our involvement. We beheld their agony and we strived to redirect and vent that energy through a genuine political process. We heard the complaints of our people and we worked to redirect them from the streets to the ballot box. Upon that pedestal, we rejected god-fatherism and money politics. Instead, we made personal sacrifices and worked with small donations and goodwill of a few good men and women. Our campaign started and remained issues-based. We attacked no persons; we looked up in faith because we believed. But from the ballots, we heard the voice of our people. We heard it loud and clear. On November 18 our people announced strongly their rejection of politicians. They traded their votes because they doubted we would truly represent their interest. While our message resonated with the people they doubted that the political class cared about them. They voted for the highest bidder. When by Thursday a large percentage of our supporters insisted that they will not vote unless we paid, I insisted we will not pay for votes. The decision not to pay ended our good run. We accept the voters’ decision. We also heard our people, by their turnout and transactional approach, as they took sides with our Party’s considered view that the issue of justice, equity and fairness should be canvassed within Nigeria. In all, we hold our heads high; high because we did not lose the poll due to paucity of ideas or lack of “structure”. We lost to superior financial firepower. As Democrats, we concede to the voters’ choices. The true hallmark of democracy is the respect for the voice of the ballot as that of the majority. But the inner truth is that we won! We won at the most important place; in the hearts of people; our people who saw us toil and push in the arena against all odds; who saw the sincerity of our mission and gave all in support of our quest for collective good. We salute you for your support and personal sacrifices to the campaign. We therefore make no apologies for our decision to refrain from money politics and chart a new course for a clean, knowledge-based campaign driven by patriotism. We make no apologies for our campaign philosophies and our positions on momentous issues that directly affect our people. We are proud to have spoken for them. However, an important issue has come out of this election. This election represented a referendum on our future. No matter the number that came out to vote, they have made the choice and we do hope that the future we all envisioned for our children and us has not been mortgaged by their action. The election, with all its evident flaws has come and gone, but now that we have engaged in the political process, we will remain engaged. We will retreat for now but we shall not surrender. We wish the Governor-elect a successful tenure, but we will still be available to point out the way and provide credible alternatives for our people. Finally, we thank all our volunteers, party loyalists and teeming supporters from across the state; courageous men and women who labored tirelessly to give wings to our dream. I salute you all. We are not discouraged but shall continue to propagate our message of a new Anambra. We shall continue on the course for which we went into the race and we shall continue to believe and work until that new Anambra of our dream is born.